In a little less than seven days, reasonable newspaper adverts will be rejected, relevant news items will be relegated, respected writers will be disregarded and a cacophony of celebratory clatter will ring far and wide across the Nigerian media space, all for one reason: Goodluck Jonathan would have officially spent a year on the throne! Yeah, May 29 is right around the corner. In honour of all longsuffering Nigerians, there is an imperative obligation for rational and coherent analysts to review the ‘transformation’ that Nigeria has witnessed over the course of 358 days spent in servitude to the boy who had no shoes. I hear someone say “Why the rush? Why not wait till May 29 when 365 days will be completed?” “Aha! I’m not easily fooled, not anymore. We all know from history that an opportunity once missed can never be regained; within seven days, every available space on radio, television, newspapers and the internet will be taken over by the same sycophants and real noise makers who would do anything to make us believe that their intention is to fix Nigeria (no pun intended). This is an opportune moment to reflect on the choices that Nigerians almost unanimously made 12 months ago when they chose humility over experience, the resource-control bowler hat over the infamous Hausa cap, an unknown architect over an overly outspoken preacher. This is the time to speak while people may still listen, because in a week, there will only be extremely loud noise. Actually, who is afraid of noise? Nigerians are generally noisemakers – think back to 2001 when mobile phones made their grand arrival on the soil of Africa’s self-appointed giant; our fathers rose to the highest peaks in the land and screamed till their lungs were sore to communicate with people who would have heard even a whisper. Think about the excessive lengths to which our barely surviving parents would go to celebrate our graduations and wedding ceremonies even when we insist on small parties; they would hear none of it, everyone must know that there’s huge a celebration in the house. More seriously, the ubiquitous distribution of IBN (I’m sure you know that means I better pass my neighbor) generating sets has further ensured that if you’re unfortunate enough to reside in Lagos, you currently suffer from partial deafness because you’re now comfortable watching ‘Super Story’ in your 1-bedroom apartment while an orchestra of 12 generating sets makes melodious music from every floor of your 5-storey building and you still sleep peacefully at night. Worse still, you’ve become accustomed to bus conductors vomiting and swallowing their saliva as they scream to attract potential passengers into the overcrowded bus in which you undertake your daily commute, you’re no stranger to Terry G’s pointless rants bursting out of extremely huge speaker boxes in every major Nigerian city, you even learned to respect your parents years ago because they were loud enough to beat you into submission with words and sticks. And if you follow the right people on Twitter, you’ve learned to juggle wide-ranging opinions from self-styled and government-branded noisemakers, and still check your dictionary for a definition of ‘noise’. So, who is afraid of noise? Not me! However, as Nigerians come to terms with the fact that they trooped to the polls rather naively in April 2011, we need to consciously evaluate the Jonathan presidency so far and make plans for the future with an increased dosage of wisdom. Those who observed the last election season carefully will recall that Goodluck Jonathan was very miserly with the specifics of his ‘transformation agenda’, saying very little of his policy perspectives and harping on ‘changing the way things are done and giving the country a new direction’. Somehow, that was sufficient enough for Nigerians to embrace him because “he is a man that God has favoured since he was deputy class captain in secondary school”, “he is a very humble man who has never demanded power but has always had power given to him” and “he met with Barack Obama in the Oval Office during his interim presidency”. As a candidate, Goodluck Jonathan found every good reason to abstain from presidential debates and focused rather on designing 36 brands of beautifully-embroidered native wears in which to tour the country, inviting Tuface and Zaki Adzay to shine a torchlight and sing his praises while he handed out notebooks at the launch of his Facebook memoir and to engage D’banj in issues of national and international relevance on live TV while his opponents dripped sweat on the debate stage. When he succeeded in fooling Nigerians to believe that he really had an agenda for the country, he scoured his predecessor’s Vision 20:20 plan and emerged with a macroeconomic framework that guaranteed 11.75% GDP growth between 2011 and 2015, persuaded Ngozi Okonjo-Iweala to give him some legitimacy and hired one of the nation’s top wordsmiths, Reuben Abati to write and speak for him when he knew not what to say. Basing his projected economic growth on oil & gas, solid minerals, ICT, agriculture, tourism and trade, he hired the exact same people that have plundered the nation’s resources endlessly to manage the economy. Who ever thought that Diezani Alison-Madueke, Stella Oduah, Jumoke Akinjide or Barth Nnaji had any expertise in helping to transform an economy? We know of their expertise in colorful dressing, expensive make-up and prolific public funds transfer, but not policy analysis or economic forecasting. President Jonathan promised a ground-breaking job creation strategy through a youth employment safety net programme including reviewing of university curricula to align with industry job requirements, promotion of vocational training, subcontracting and partnering of locals with foreign construction companies and implementation of mandatory skills transfer to Nigerians by foreign construction companies. His record to date is soiled with countless strike actions by federal and state universities, incessant bombing and threats of bombing across 19 federal tertiary institutions, and the construction of a massive cathedral in Otuoke by an Italian construction company (at least something has been transferred from the foreign construction companies to the locals, even if they are not skills). The review of the NYSC was supposed to be a fundamental approach towards alleviating youth unemployment but starving young chaps for months in the name of service to the fatherland was not included in the reform documents! Is it appropriate to discuss the public expenditure component of the president’s transformation agenda? What has changed over the last one year? Herman Hembe and his fellow brigands at the Federal House of Representatives have demonstrated clearly enough that it is still business as usual at Aso Rock. Nuhu Ribadu has uncharacteristically gone quiet since his appointment to that phony Petroleum Review Task Force and Christopher Kolade now has the guts to assure Nigerians that the benefits of the Subsidy Re-investment and Empowerment Programmes (SURE-P) are now being evident on Nigerian roads and health services. Is there something in Aso Rock that rids otherwise reasonable people of their intelligence? The list of patriots gone haywire is disturbing: Ngozi Okonjo-Iweala, Nuhu Ribadu, Reuben Abati, Christopher Kolade and even Ohimai Amaize! How can people who were once on our side make the transition to the other side and then insult our intelligence by telling us that things are working but we just can’t see it? All we want is to see it! Why is that so difficult to understand? Every other aspect of the president’s transformation agenda gives significant cause for concern: judiciary, education, power, transportation, health, labour and productivity and ICT. The President has failed to inspire public confidence in the judiciary with the poor handling of the Justice Ayo Salami case, the continuous incapacitation of the EFCC and the slap delivered to the Nigerian justice system by the British courts in the James Ibori case. Education remains a sham with bombs rattling off on campuses in session while other campuses remain closed for fear, poor electricity or lack of pay. As for electricity, let’s just pray that we can continue to fuel our generating sets until each individual learns how to generate their own power, because Barth Nnaji is off his rocker again promising stable power supply by 2013 and the University of Ibadan is poised to spend N1.25 million daily on diesel to generate 10 hours of power supply through two newly custom-built generating sets ordered from Germany (no kidding). Transportation remains a disaster with ever unfailing power failures across major airports, inability to sort out a reasonable contract for rebuilding the Lagos-Ibadan expressway and endless promises of the return of the rail system. Health remains an issue for churches and their wealthy pastors; labour will soon declare another nationwide strike and everybody has learned to conduct ICT business on their Blackberry phones, so there goes the Transformation Agenda! In spite of all these, President Goodluck Jonathan will definitely be praised to high heavens next Tuesday for his visionary direction, passion and commitment to a new Nigeria. He will be congratulated for leading the country with the fear of God and the interest of all. He will be celebrated as being a courageous, dedicated and compassionate Commander-in-Chief. I can stand many things, but deception is not one of them; so before the noise resumes next week, I just thought to remind you that we Nigerians remain an extremely large and disproportionate body without a functioning head. Very well coordinated stream of thoughts. U mean Amaize no longer speaks out against de injustice in de land? Does he hav an appointment in de govt or govt parastatal? Pass the ammunition please! The fight just got better and the robbers will not go unpunished. 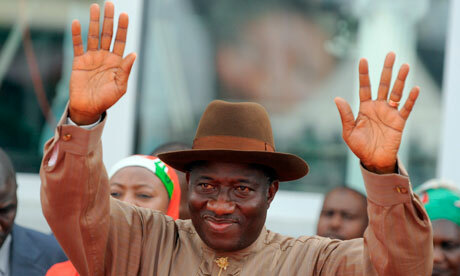 As for Jonathan, he should just have remained as a man for ‘good luck’ cannot lead a nation. You can’t camouflage an empty brain with a bowler hat!